This workshop is organised by ECAS, in partnership with Citizens Advice International (CAI) with the support of the Government of Gibraltar and Hassans International Law firm. The aim of this debate is to consider how citizens’ rights could be impacted under different Brexit scenarios and to enable citizens to better assert their rights and advocate for the best possible outcome. The debate is a part of the project Brexit Takeaways, which aims to provide citizens with evidence-based information on how the final deal reached between the EU and the UK might impact their rights, in order to allow them to advocate for the best deal when negotiations start and assert their rights once an agreement is reached. 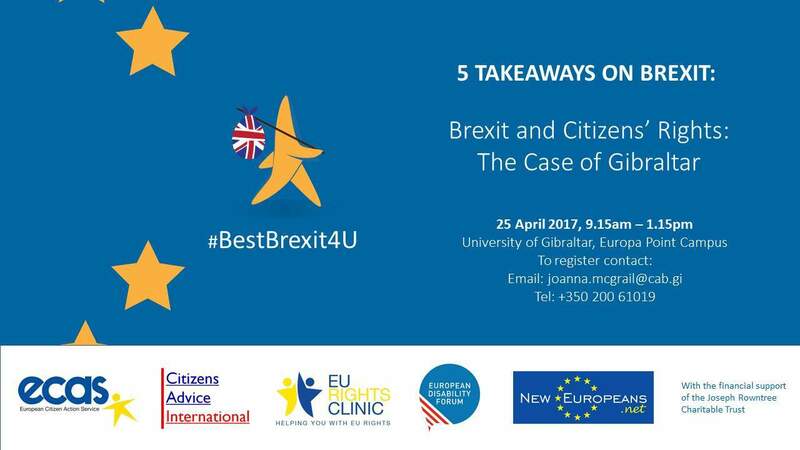 A series of events are being organised in London, Northern Island, Gibraltar and Belgium, from March to June 2017, to disseminate and discuss the findings of the study on which this project is based. The partners acknowledge the financial support of the Joseph Rowntree Charitable Trust, the Government of Gibraltar & Hassans International Law Firm Gibraltar for the organisation of this event. To register for this event, please send an email to joanna.mcgrail@cab.gi (tel: +350 200 61019).